Some random sketches. The first one I liked, and its done on a friend's sketchbook, so I asked for a copy to post it up here. 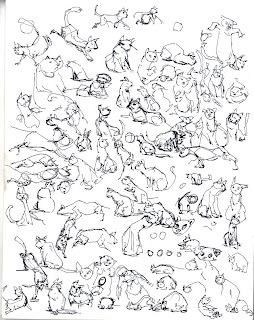 The other is a random page of cat studies I was doing to get the hang of cats, and I was kinda surprise some of my classmate liked it. It's so rough and disproportioned haha, since this blog isn't getting much stuff I thought I'd post it up too. It threw me a little off when alot of people I talked to said they prefer looking at sketchy stuff, I thought I was the only one. I grew up in an art culture in which alot of emphasis was on cleanliness and sleek designs, so I never bothered showing off my stuff. My approach had always been trying to capture life, thanks to all the animation books I been reading (The latest one being 'Drawn to Life'! go get it), so I think alot of my sketchy stuff is not very impressive to begin with. No cool factor to it. One of my teachers use to say, 'concentrate on structure! The line quality will come on its own.' Haha here's hoping. Darryl! Your sketches are amazing! This is also why you are so great at animating, you are a structure god haha. Nice stuff :) Keep it up!